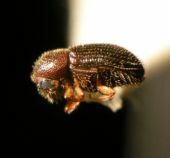 This webpage has been created to provide updated information on the confirmed infestation of the Coffee Berry Borer (CBB) on Hawaii Island. In a collaborative effort, staff from the University of Hawaii at Manoa – College of Tropical Agriculture and Human Resources, U.S. Department of Agriculture (Animal & Plant Health Inspection Service, Agricultural Research Service-Pacific Basin Agricultural Research Center), and the Hawaii Department of Agriculture are working together to develop methods of control of CBB and to assist farmers in mitigating the effect that CBB may have on coffee crops. Early on, HDOA and USDA invoked the Incident Command System (ICS) to manage this ag pest situation. ICS is used by most emergency response agencies to manage situations to increase efficiency and communications. The Hawaii Board of Agriculture expanded quarantine restrictions on the movement of coffee and other CBB hosts from all areas of Maui. The Maui quarantine takes effect on May 1, 2017. To view the restrictions, click here. For information on how to apply for the CBB Pesticide subsidy program, click here. Hawaii Board of Agriculture issues quarantine restrictions on Waialua Coffee. HDOA has established permanent rules regarding the interisland transport of green coffee beans (unroasted), coffee plants and plant parts, used coffee bags and coffee harvesting equipment. To view the new administrative rules, click here. To view the Notice to Interisland Importers, Shippers ad Transporters of Coffee Plants, Plant Parts, Unroasted Coffee Beans, Used Coffee Bags and Coffee Harvesting Equipment from Hawaii Island, click here. HDOA and USDA are using Global Positioning System (GPS) technology to document and track CBB infestation sites. This increases accuracy in site surveying and monitoring of areas of infestation.